Dostoevsky was a humanist of the Golden Age of – Solzhenitsyn wrote in the era and almost the style of Stalin. 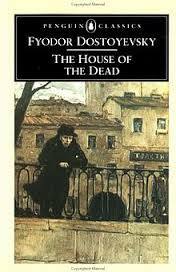 Dostoevesky emphasized the human qualities of prison life, the convicts as well as the guards (for better or worse). Solzhenitsyn wrote of the inhumanity of the institution, the monotony, the degradation. Dostoevsky’s work is very personal with both tragic and humorous moments, memorable characters, a chronology of several years and a rather spiritual ending. Solzhenitsyn’s work stresses the inhumanity of the gulag system very briefly including the people met and grinding labor details of one very monotonous and depressing day which will be the pattern for the next 10 years. In “House of the Dead” Alexander Petrovich Goryanchikov, a gentleman, has been sentenced to a labor camp for 10 years for killing his wife. The other prisoners are primarily peasants who despise the gentry and this makes life difficult for Goryanchikov and the few others in his situation. Because Alexander Petrovich does not really “fit” with the others he is more of a loner who makes his own observations- and he makes lots and lots of very astute observations about the characters, the likes of whom Dostoevsky probably met, but which can sometimes feel just a wee tad like “type” if you want to read it that way- especially in Part 1. Alexander Petrovich has enough money to pay “servants” (other convicts) and buy little things or lend money. Our narrator also observes the prison routines, regulations and setting – the baths for instance – but then how one character enjoys this or that more than the others. Vodka sales and Jewish rites are described, but the Christmas celebration scenes including the convict performance are wonderful – like a real “slice of life” in a Siberian labor camp. I think probably these detailed scenes are generally accurate, taken from Dostoevsky’s experience. This section actually sounds like a tract for prison reform. And there are all manner of 19th century religion here – from “Old Believers” to Jews and Orthodox Christians. There seems to be no judgementalism on the part of Dostoevsky or his narrator and although Jews are pointed out, so are Poles. There was a great deal of anti-Semitism at the time and that certainly is evident. The character studies are fascinating – there’s Petroff, known for his criminal ruthlessness as well as curiosity, and Isaiah Fomitch, the much ridiculed Jew known for his bartering skills and respected for that. It is also Fomitch who loves the baths. Sirokin, is a very lightly veiled homosexual who apparently offers services as needed. Several other perhaps less colorful characters are described. At the end of Part 1 all these characters come together for the amateur theater production which kind of weaves everyone into a community. Part II gets into more detailed stories about individual convicts or events. It starts out with Alexander Petrovich’s time in the hospital where he was taken after Christmas because he was feeling ill. He comments on various prisoners and their ailments – the patients who are there because of flogging or the others due to fever or consumption. Some of the patients liked being patients, they all seem to appreciate the doctors. Alexander Petrovich is bothered by the chains which are not terribly heavy (about 10 pounds) but can do damage after wearing them for years. He is disgusted by the fact that even the dying men have to wear chains although there is no way they can escape and if they could, the chains wouldn’t prevent that. Then he goes on to describe the whippings and beatings as well as the convicts who are punished, the officers who order it and the executioners to carry it out. Different people handle it different ways. Part 2 continues with longer stories on several topics, the hospital provides the story of a man who, while drunk, marries a woman of less than stellar virtue. This story is told by one patient in the hospital to another with Alexander Petrovich overhearing it, so it gets complicated. Stories about the chains and about freedom (forest life tramping), and escape attempts, are told as well as several about animals (horses and dogs) as well as tales of the men of his own class. But much of Part 2 is comprised of sociology type observations and really quite interesting, especially from an historical pov – and it does seem rather universal – true today also. I’m hard pressed to articulate the difference between Parts 1 and 2, but there does seem to be a distinct one – The book ends with Alexander Petrovich finally being released.